Castle on the River Lee, in Ireland. The original building on this site was a castle with a circular castle, built by citizens of the town in 1582 to protect the passage from the harbour to the city and included a turf beacon to guide ships. A fort, built by Lord Mountjoy in 1604 to strengthen defences against Spanish invaders, was built on the same site and was perhaps a renovation of the earlier castle. 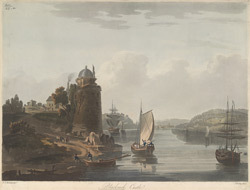 The castle was destroyed by fire and laid in ruin (as can be seen from this view) until it was rebuilt by the Corporation in 1828 at a cost of £1,000.